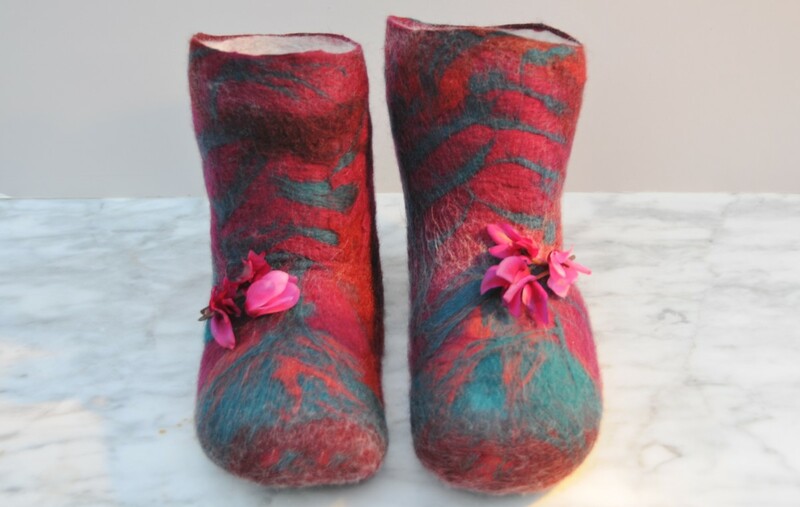 Felting Slippers over Aqua Shoes! When I found a pair of transparent Cressi Water Swimming Beach Shoes in a charity shop I knew immediately that they would make a great substitute for expensive shoe lasts. 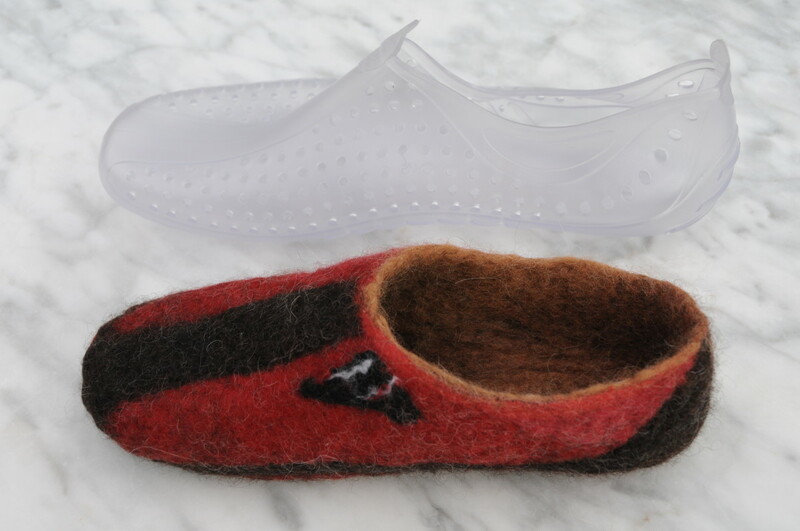 I had been contemplating buying a pair of Polystyrene Shoe Lasts for a while but was unable to commit to buying them because they can be expensive, more so if you need to make slippers in several sizes. Using a template for making slippers works well but does not always result in perfect results if you don't have a pair of shoe lasts to shape them on! 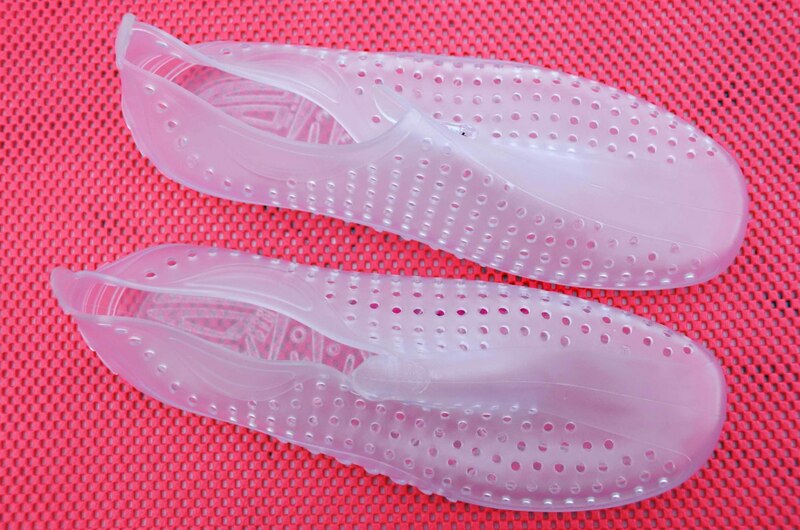 The Aqua shoes were made of transparent flexible plastic which when I put my feet into them, I could see that they were too big, especially in the toe area but that extra space was just the amount of shrinkage I was going to need to make the slippers the right size! After completion of the project, the Aqua shoes still look like new. I believe I could be making shoes on these 'lasts' for years to come. The size I bought was a 46 (or 10 1/2). I usually wear a 40(7). I really don't think I could have found anything more perfect than the Cressi Aqua Shoes for this project. I hope you will enjoy this Tutorial. I very much look forward to receiving any feedback or comments you might have. Please remember that no part of this tutorial should be copied or transmitted without my express permission. Plastic Bags surplus to requirements. Pad the shoes out initially with a little stuffing. You make like to use a few plastic bags! I used a few small plastic bags which I filled lightly with polystyrene foam balls. It is not absolutely necessary but it does help to pad the shoe out a little so that you can achieve a better shape. You can remove these later in order to put your hands into the shoe which to give the wool a good massage later on. 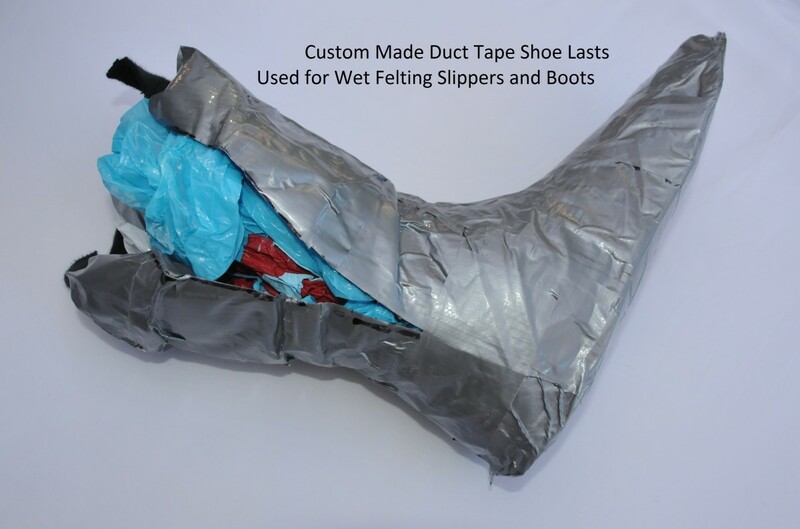 Start by preparing any decoration you would like to add to your shoe. 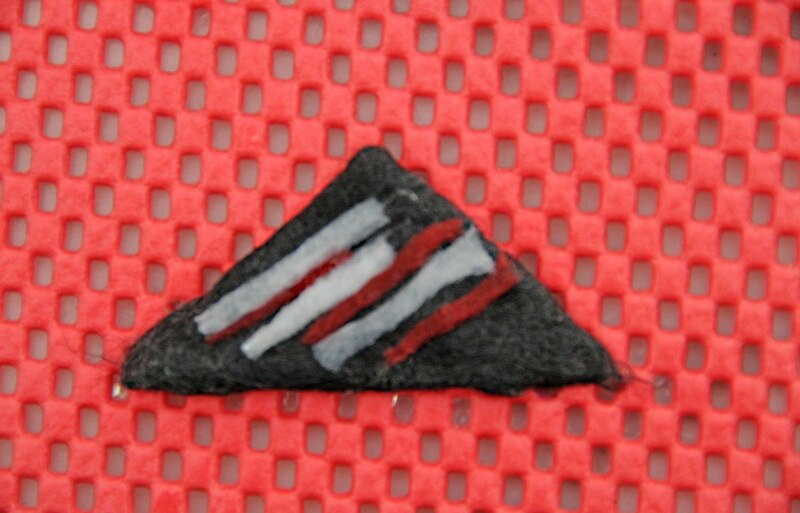 Here I made a simple triangle from a few fibres and added a few wet strands of wool for decoration. You may wish to leave this out entirely and just simply add different colour wool fibres to create your masterpiece. In this tutorial, we began by putting the decoration face down on the surface of the Aqua shoes. We will be working in reverse order so that when the slipper is turned inside out, the surface design will appear on top of the slipper. Doing it this way will ensure that you get a much nicer finish to the slippers. I based some of the decorative ideas on the already moulded design on the shoe by putting a logo of my own design over the one already on the shoe. Place the logo on the outer right and left sides of each Aqua Shoe. Add any stripes by first splitting a long piece of wool fibre from a length of merino wool roving. Wet it with warm soapy water first and use this to make stripes around the edge of each shoe as shown. Follow the lines indicated on the pre-formed shoe. The wet wool will easily stick to the shoes. You may wish to add small flowers, spots, stripes or any other decoration at this time, or none at all! In which case, you should just proceed by adding four layers of fibres, one layer at a time to the surface of each Aqua shoe. 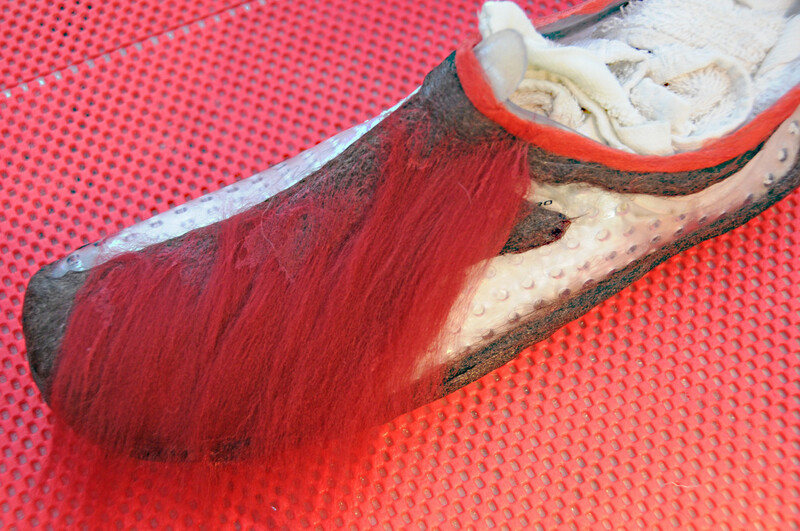 Add one layer of fibres to the surface of the Aqua shoe and then cover the sole of the shoe with wool as shown below. 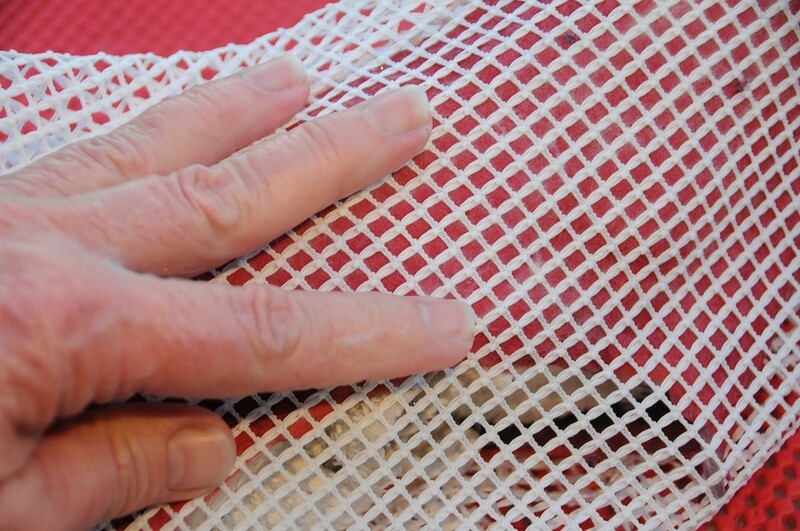 Once covered, rub gently for a few minutes and then add the next layer. Repeat the first layer, three more times. 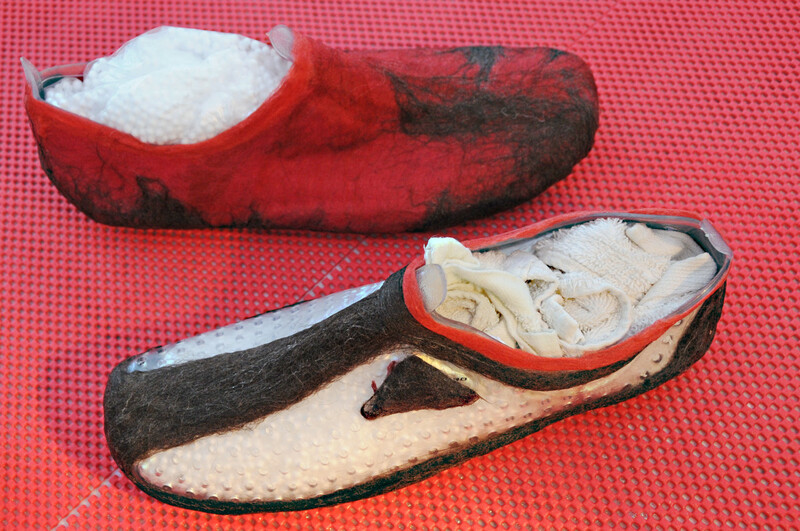 Cover the Aqua shoe with four fairly thick layers of wool fibres. Alternative the direction in which you place the wool down in as much as is possible. 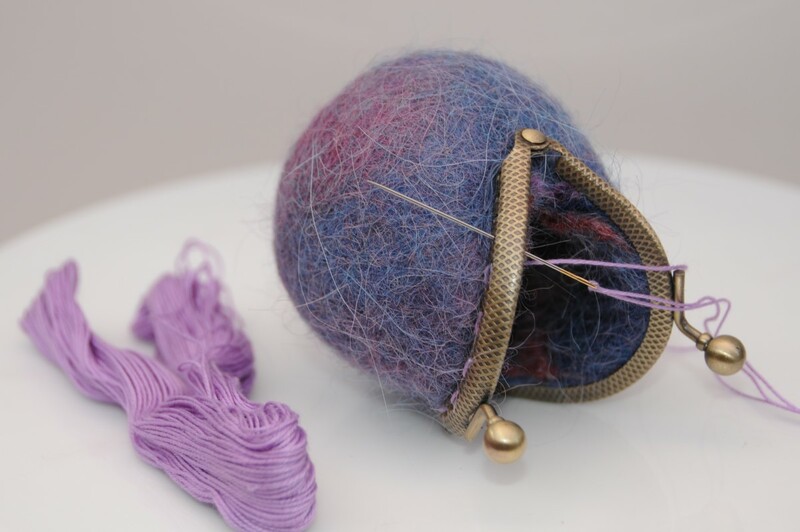 This will help the wool fibres bond to one another once you start adding friction in the form of rubbing. Use colours of your own choice. Choose a different colour for each layer. It makes it easier to see which area of the shoe has already been covered before. 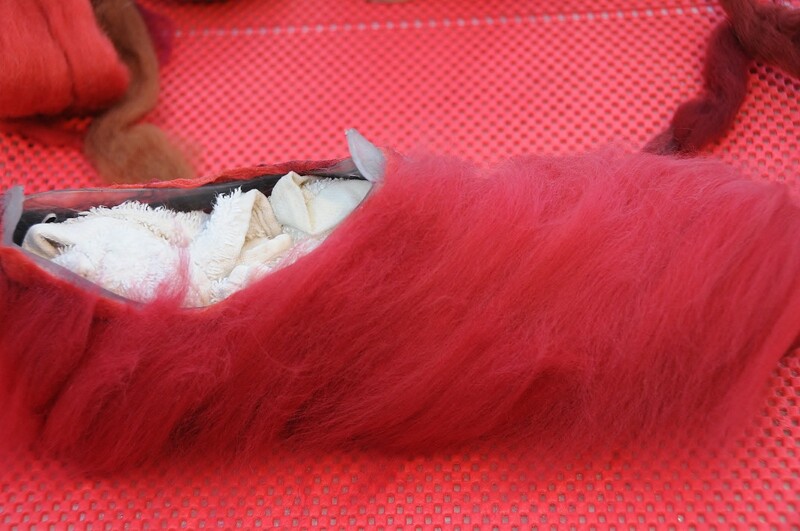 Once the four layers have been completed, you may wish to extract the stuffing and put your hand right into the shoe so that you can really get down to business! Rub all the layers of wool until they have felted together. This is the most important stage of the felt making process. Insufficient rubbing at this stage can cause your slipper to disintegrate if you try too early to remove the Lasts. Better to be safe rather than sorry later! Take the shoes to the kitchen sink and pour some very hot water into each shoe for a minute. Ensure that the whole shoe becomes hot and wet. Pour the hot water out and plunge the slipper into cold water. Do this several times and then rinse both slippers carefully under warm water. Be gentle with them. Squeeze any excess water out and begin gently at first, dropping the slippers down onto the surface of the draining board. After a few throws, take them outside and flick them against an outside wall. You will start to feel the fibres tighten up. Once this happens you can hit the wall or draining board a bit harder. The slippers will shrink considerably. Rinse the slipper again. 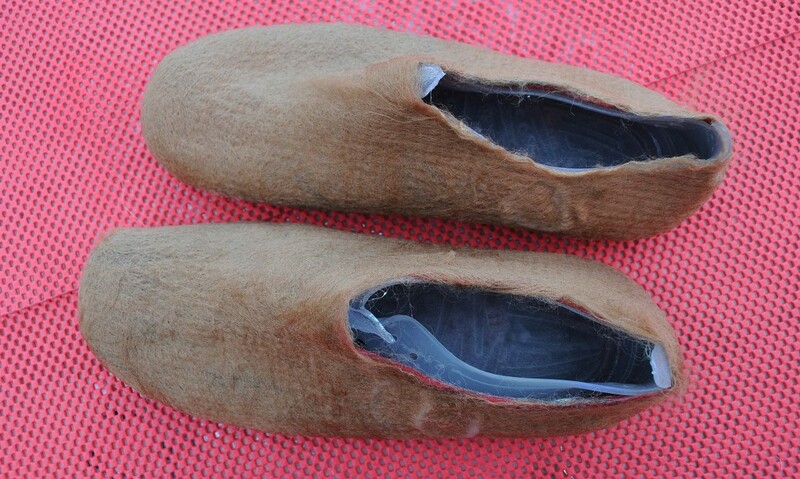 Squeeze out any excess water and then start shaping each slipper with your hands. 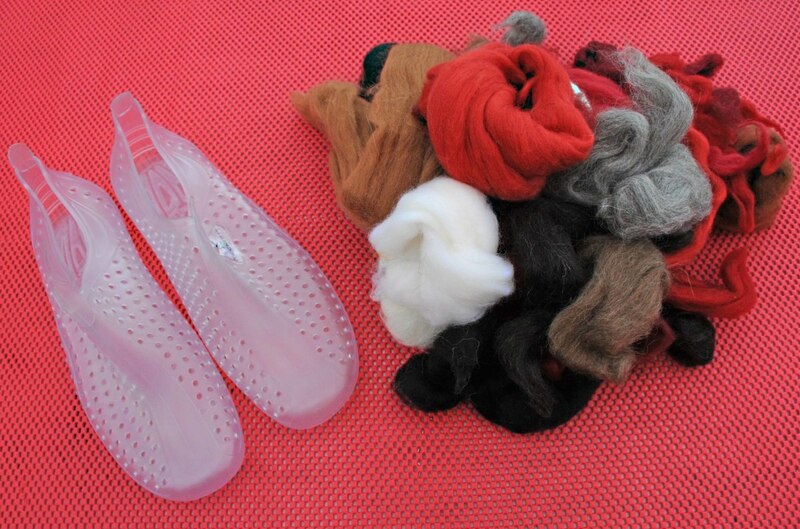 Try shaping the slipper on your own feet or you can put a smaller size Aqua Shoe back into the slipper. 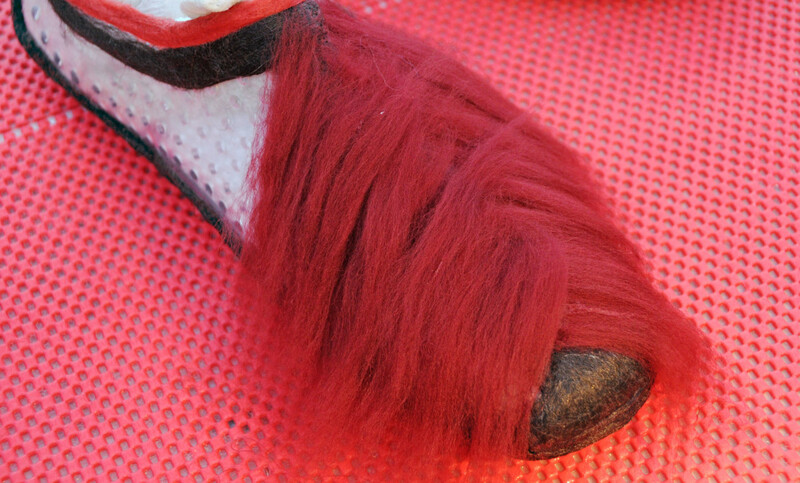 Rub the fibres around the shoe and you will have a perfect slipper. Use a towel to remove any excess water whilst it is still on your foot. Remove and then leave it to dry on a rack or radiator. 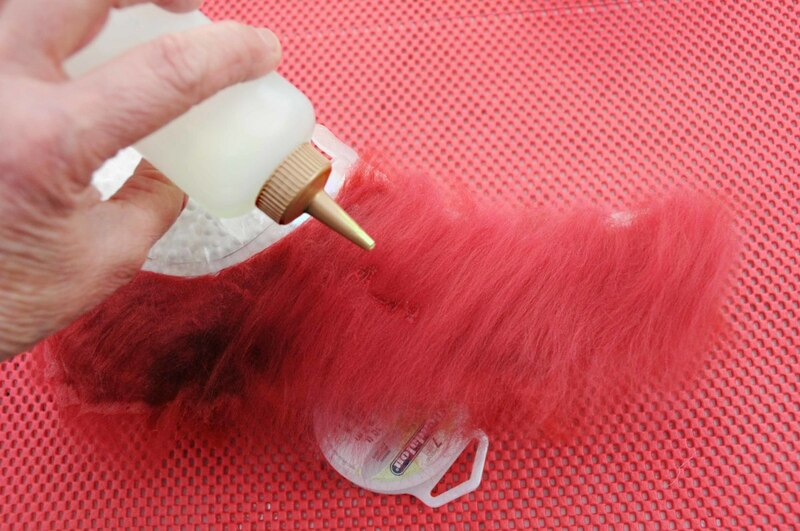 This is the second part of a two-part Wet Felting Tutorial. It is specifically aimed at people who find it difficult to find footwear which fits them perfectly. Please check our my little Boho boot Tutorial as well. 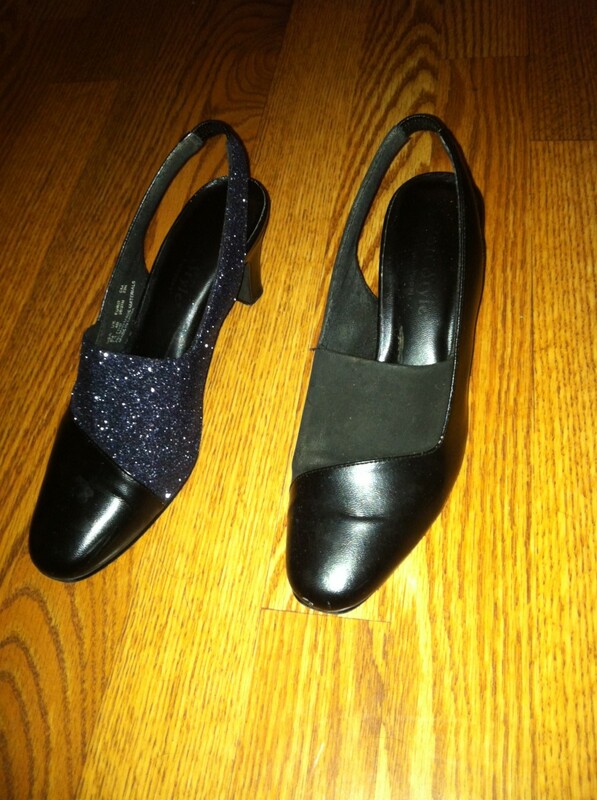 You will see that I used a template and plastic shoes similar to these to get a nice shape. I have several, boot and slipper Tutorials. Each one is different but you should be able to use your aqua shoes for all of them, even if you just use them as Shapers. 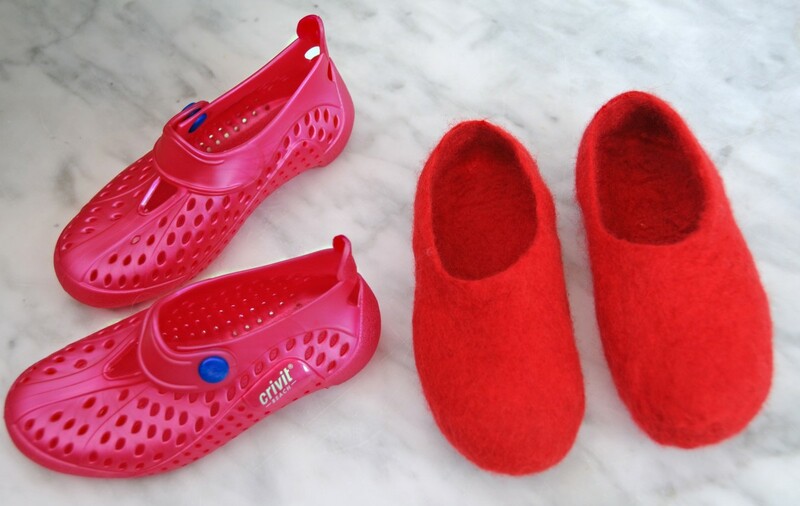 There are so many ways to create boots or slippers. You don't always need expensive shoe lasts to create them with. Remember that you don't have to finish you project in one day. Better to put your fibers down carefully and evenly and avoid any thin spots. Don't rush it. You can always return to the project the following day, wet it with more soapy water and continue rubbing. Better to rub until you are satisfied that the fibers will not move. 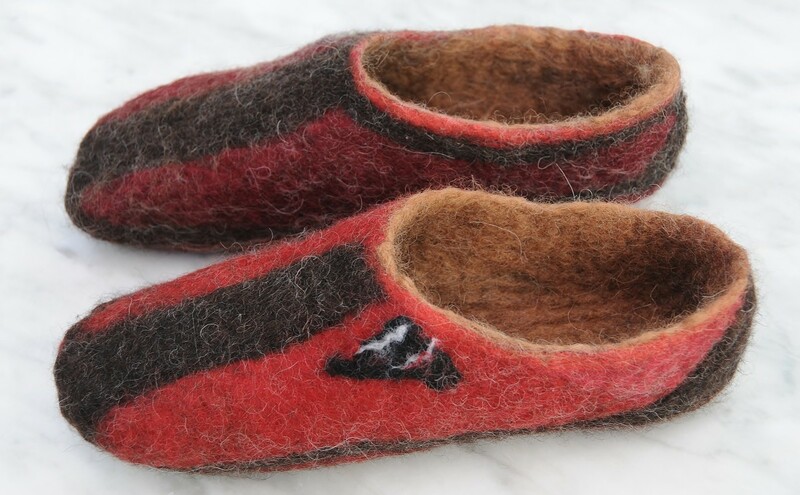 You should have no problems making a pair of slippers. 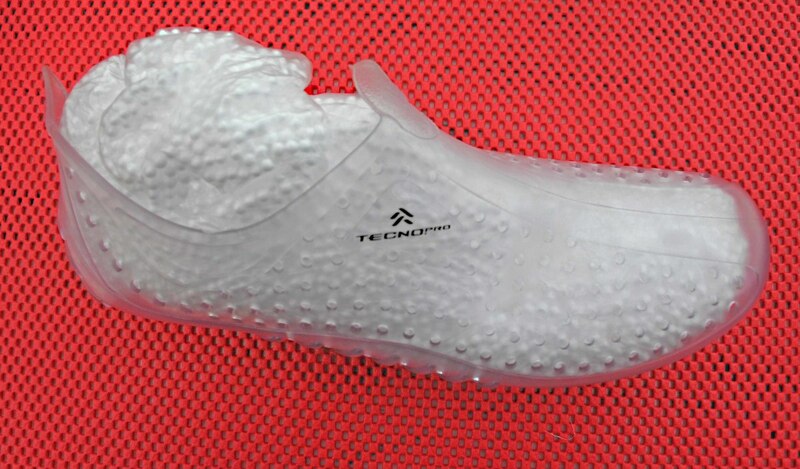 Shrinkage of about 30% will take place so try to ensure that your aqua shoes are bigger than the actual shoe size you need if you are making them for yourself. Going to try this soon. Have all my things ready - really hoping it works out. its my 1st felting project. I think I would go for something which ia thirty percent larger, probably a size 10.5. You can probably work on most wool shrinking around thirty percent. The more you tumble dry it, the more the wool will shrink. 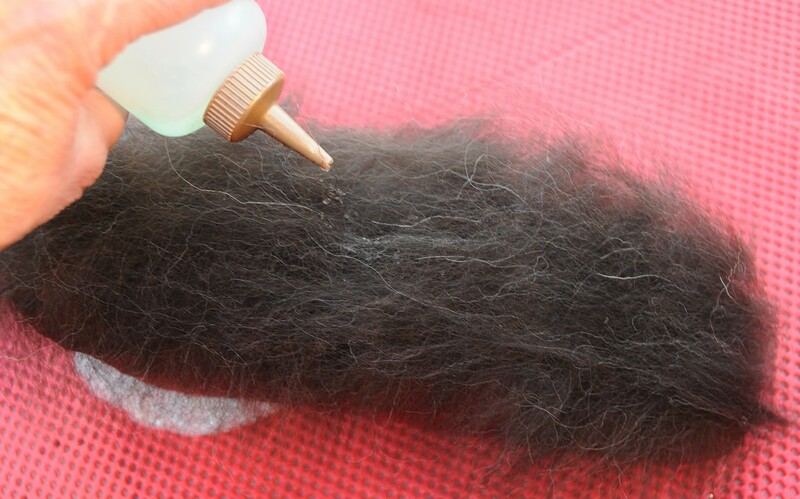 If you shrink it too much, try wetting the project again to pull the fibers out a bit more. Keep on checking your slipper in the dryer. Don't leave it there too long. 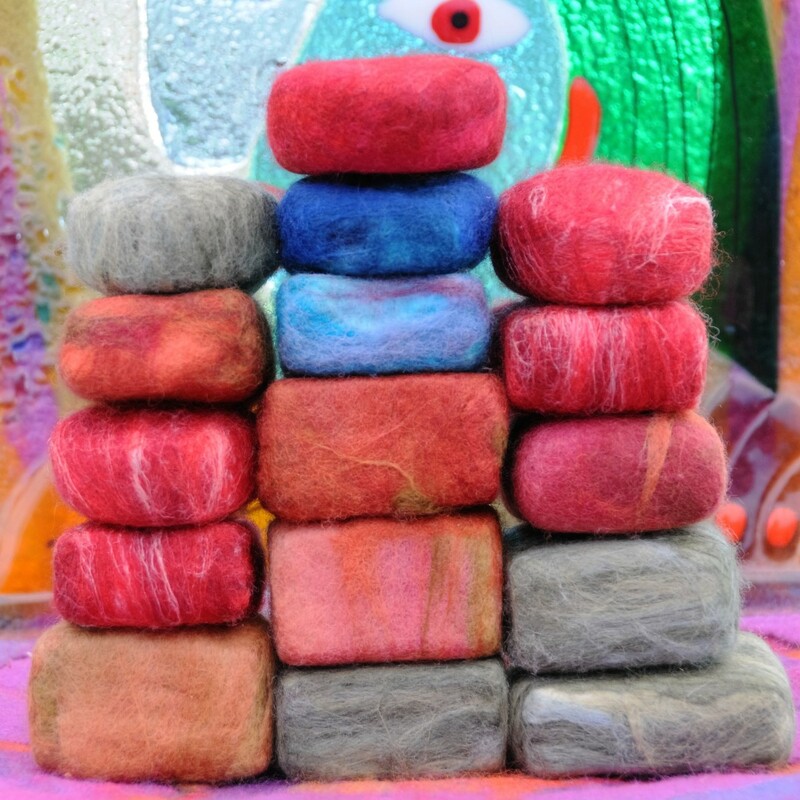 Unfortunately felting is not an exact science and every kind of wool will shrink differently. I hope it goes well. Hello, I would love to try this but I got a tad confused about the sizing. If I wanted to end with a men's size 7.5, what size jelly should i get? Good, I hope that you enjoy creating your own pair of slippers on Aqua Shoes. I would say that if you are going to wear them outdoors, you could attach a commercial sole or a sole made of leather. I do think these would be great with my jeans. Thanks for the idea and directions. Very well done. You are very welcome, thanks for your visit. Interesting and so useful sallybea. 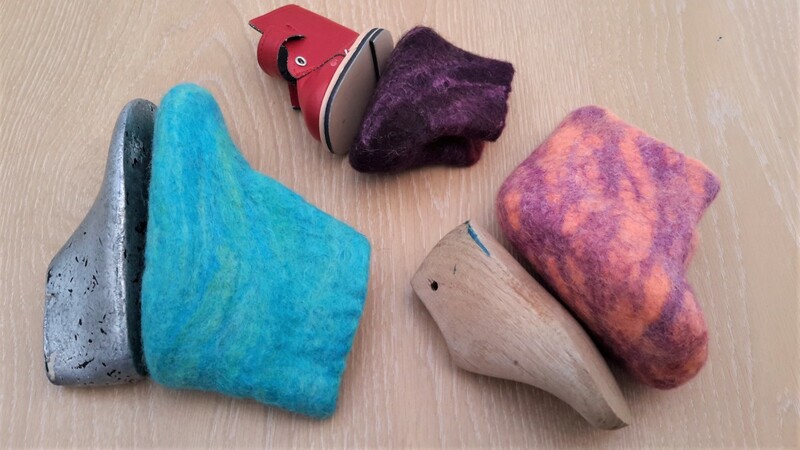 I amglad that you enjoyed the step by step felting Tutorial. 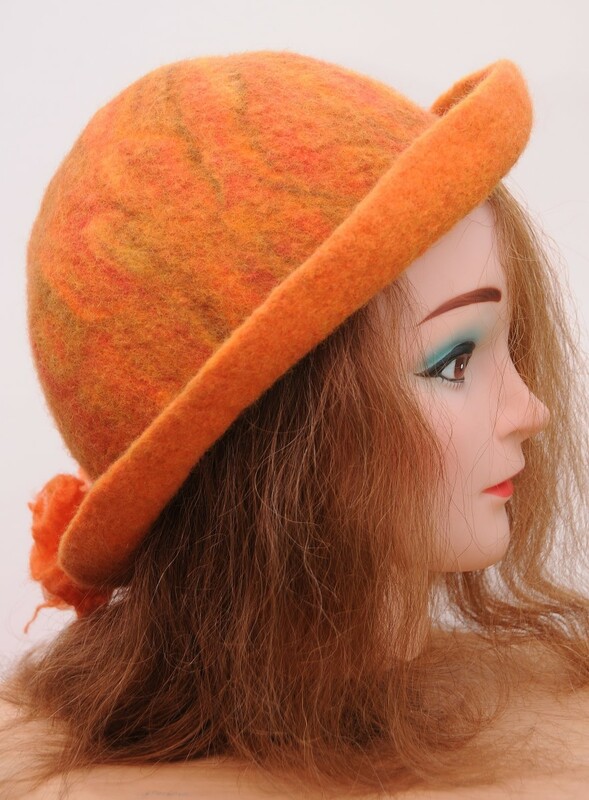 Felting is not an exact science I am afraid - things can and do go wrong but it is surprising how you can get yourself out of a jam. The tumble drier and the microwave oven, also and electric palm sander can be useful tools to add to one's arsenal. I especially like that you've offered a hint on how to correct it if things didn't go as planned. Great step-by-step instructions and photos. Thank you Sallybea I had lovely Sunday and now another week ahead have a great one. Thank you very much, that is much appreciated. Passing this on to the crafty people in my circle of friends. Wonderful craft, Sally! Well done! Lovely to hear from you. Thanks for the vote up, the tweet and the Facebook share for my Slipper Tutorial. It is much appreciated. Incredible idea you always find such creative activities. Sally I learned how to make such simple kind of slippers from your informative hub. Voted up, tweeted, Facebook shared and pinned. Thanks for the nice comment, Up, pin and the tweet. I very much appreciate all the support you give me. You have a lovely Sunday too. Another awesome hub here, Sally! As always, your instructions are perfect along with the photos are great to see exactly to what you are referring! Great job once again!